The pine plantations at Silloth are a key feature of The Green, being part of the original Victorian planting scheme and lying within an AONB and a Conservation Area. The plantations have been used by local youngsters for many years as an informal play area. 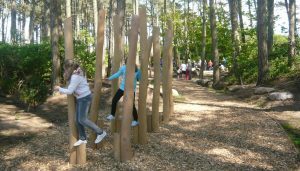 As part of the Silloth Green project, it was decided to create a dedicated woodland play area in one of the plantations, in order to support and encourage appropriate use by local youngsters and visitors. 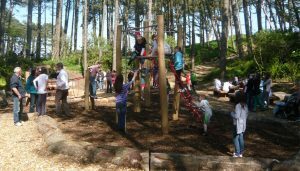 Working with a specialist play company, proposals were developed for a new woodland play area. 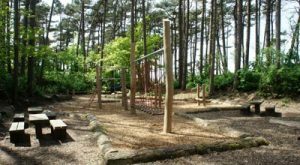 Equipment is woven in amongst the trees, with a series of new woodchip footpaths weaving their way through the woodland between new play features and providing access to scenic new picnic areas sheltered from the coastal winds. 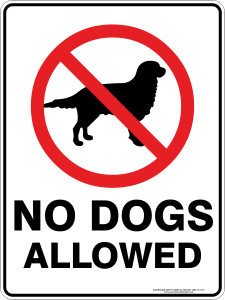 Please contact the Town Council Tel: 016973 31128 or email: townclerk@silloth-on-solway.co.uk to report any damage or graffiti in any of the play areas. Alternatively, complete our Contact Form.